“Knowledge is power” – This old adage makes even more sense right now than it did before because of how everyone is seemingly connected through the World Wide Web. However, because knowledge is in fact power and can give your business an unfair advantage over your competitors, the flip side of the coin is also true. Acquiring wrong information about something – and believing it – can be very destructive to your business. It’s precisely because of this that we need to debunk myths and make sure that the information that we’ve acquired can be trusted. I am quite disturbed at how prevalent the myths about merchant accounts are. I see them plastered all over the web, and even some of the business owners whom I meet personally, seems to have bought the idea that these myths are true. The result – they fail to take their business to the next level. The success that their business rightfully deserves is undermined by these myths. They become very limited (when they shouldn’t be), and they end-up losing thousands of dollars in the process. In the worst cases, they end-up closing. Are you one of the business owners who have been seeing these myths as actual truths? It’s high time that you check the quality of information that you’ve acquired about merchant account processing. And the good news is, I’ll help you with that! 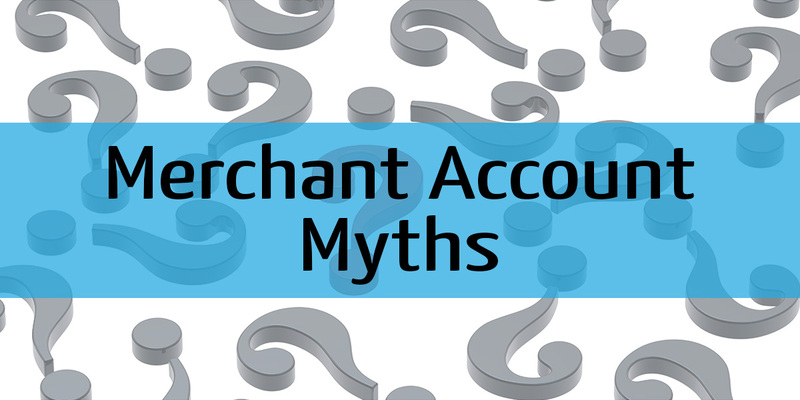 Allow me to share with you some of the most common myths about merchant account processing. I have found that the most business owners who believe this to be true are the ones who run a traditional business. It could be because they’ve become very comfortable with their existing business process. Or, simply because the phrase “merchant account” in itself, sounds complicated and expensive. Let’s be honest, you probably thought the same too when you first heard about it. But the thing is, getting a merchant account is really simple. As seemingly complicated and expensive as it sounds, it actually isn’t. The process is quite straightforward and there are specialists whom you can contact to help make the process a lot easier for you. If you need help with setting one up for your business, you can contact us. And just so you know how simple the process really is, here’s the gist of it. 1.) Look for a reputable merchant account provider and send them an email or fill-out their contact form. 2.) You will then be contacted by one of their associates to help you with the merchant account application process. This is the stage where they’ll usually ask for the requirements. Some of the requirements include bank statements and signed direct debit mandates (among many others). 3.) Once you’ve been approved, you’ll receive a welcome packet with the terminal and all other equipment that you’ll need to have it installed. The welcome packet will contain very detailed instructions on the installation process so don’t sweat it. That’s basically it. Not such a complicated process, right? This one’s definitely a myth. The market has now become so competitive that a lot of the previous fees have either been removed or drastically lowered. The best part is, merchant account providers nowadays offer a customized merchant account to fit your exact business needs. Because of the customized merchant account, you can opt for services that only apply to your business so you can save on every aspect possible. Simply put – you can avoid the fluff and pay only for the things that you need. This makes having a merchant account more affordable for you. You need to be very careful when it comes to choosing which merchant account providers to go for. The reason why several business owners have fallen for this myth is because other merchant account service providers ONLY mention/advertise the low debit rate. They purposefully don’t tell their customers of the high rate involved in credit swipes since chances are good that it’s going to turn them off. No matter how you look at it, this strategy is misleading. I’m a firm believer that white lies are lies nonetheless. When merchant account providers compromise their integrity by telling a white lie (by omitting some of the facts), they usually end up ruining their business and their customer’s as well. Be sure to ask the merchant account provider the swipe rate for both the debit AND credit transactions. The fact is, accepting credit card payments have a lower established risk compared to handling checks or even cash. Considering how credit/debit cards are widely used nowadays, there are several security protocols that you can implement to avoid putting yourself in a tremendous amount of risk when accepting credit card payments. You can use both of these tips to prevent fraudulent charges. 1.) Use Visa and Mastercard’s CVV2 and CVC2 feature. 2.) Use AVS (Address Verification service). Statistics show that there are over a billion credit cards in use right now. And that’s just in the US. You’ll be missing out on TONS of sales if you aren’t able to process payments via credit/debit card. Considering how competitive the market is right now, you can bet your family jewels that your competitors are able to process credit/debit card payments. If not, they are working on being able to do so. And if you don’t have the ability to do just that, then you’ll surely be left behind. Have you fallen victim to any of these myths? If you answered, ‘yes’, we’d love to hear more about your story and how you managed to get over the ordeal. If you also have any questions or are in need of help with your merchant account processing, then contact us now.